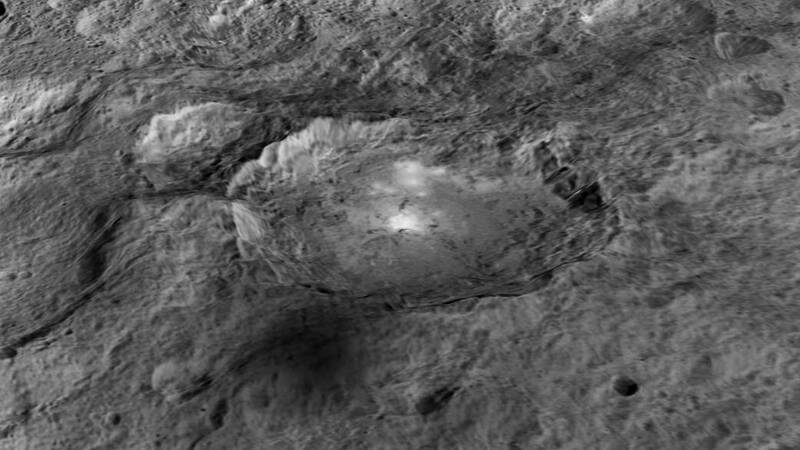 Ceres: the Best Place in Space? They could be salt, but they’re more likely to be ice. If so, it’s being constantly replenished from beneath, since it would sublime away into space in the relatively warm asteroid belt. They could be cryo-volcanoes, oozing ice instead of lava. It may even have a liquid underground ocean, one that has been freezing slowly over the giga-years, but is sometimes squeezed up to the surface by pressure from an expanding ice shell. So Ceres might have a lot of accessible water, which is the most basic requirement for life. It’s also the most basic requirement for space travel, since with water and electricity you can make rocket fuel out of O2 and H2. Ceres is still close enough to the sun that it has lots of solar power, although it’s 7X dimmer than in Earth orbit. Yet that also means that it gets much less dangerous radiation from solar storms. Its surface area is the same as the land area of India, so there’s lots of room. The spectrum of its surface is like that of carbonaceous chondrite meteorites (which makes it a C-type asteroid), so it has lots of organic compounds. With organics, water, and sunlight, it’s possible to actually grow things. It has a low gravity, only 0.03 G. That’s probably too low for long-term human health, but no one really knows how much we need. It’s still better than the zero-gee that orbital stations like the ISS have to deal with. Zero-gee is clearly bad for us, and is a nuisance in general, since plumbing doesn’t work and bits of gunk float into everything. The Russian Mir space station ultimately became uninhabitable due to mold, since it was impossible to clean everything. The smell was apparently hideous. Even a little gravity would make it much easier to wash things down. If 0.03G really is too low, one could possibly build centrifuges, at least for sleeping in. Yet the low gravity is a plus if you want to actually do things in space. It makes it much easier to get on and off of Ceres compared to the Moon, Mars, or the moons of Jupiter. The effort to get away from a body is defined by its escape velocity, or delta-vee, and the size of a rocket goes up exponentially with delta-vee. [To be exact, the Tsiolkovsky ideal rocket equation says that mass_rocket = mass_payload * e ^ (delta-vee / exhaust_velocity).] It takes gigantic multi-stage rockets to get away from the Earth, with its delta-vee of 11.2 km/sec. It’s still huge for Mars at 5.0 km/sec. For the Moon at 2.4 km/sec it took half the mass of the LEM to get away. For Ceres it’s only 0.5 km/sec. You could get into orbit around Ceres with only an 0.24 km/sec (540 mph) push, and thereafter use a tremendously efficient ion thruster in order to travel around the solar system. This is what Dawn itself used. It needed only 385 kg of xenon propellant to move the 1200 kg (initial) probe from Earth all the way to Vesta and then Ceres, although it did use a Mars gravity assist. Ceres could be a base for asteroid mining. X-type meteroids are solid metal, and have high proportions of valuable elements like platinum. The company Planetary Resources is already working on this, although they’re targeting Earth-crossing asteroids. Ceres itself might be able to export water and organics to LEO, the Moon, or Mars orbit. It’s a lot easier to bring it down than to bring it up. Low Earth Orbit Has no physical resources, no gravity, no radiation or meteoroid shielding. Does have more solar power and is a lot closer. Moon Has practically no water or organics and has a deeper gravity well. Isn’t too far away. Venus Hellishly hot surface and an atmosphere of sulfuric acid makes it utterly uninhabitable. Even probes only last for minutes. Does have good gravity. Jovian Moons Really deep gravity well, no solar power, bad radiation levels. Could be life on Europa. Kuiper Belt Objects Several billion miles away. Are likely to have water and organics, and would have no radiation hazard. Karl Schroeder uses them as interstellar stepping stones in his striking novel “Lockstep”. It’s not all that promising a list! Space colonization is a terrible idea in general, but if you’re going to have some self-sufficient manned space bases, Ceres might be one of the best places to go. This entry was posted in Uncategorized and tagged space-ish. Bookmark the permalink.